CMN Sports announced today that it will host an open practice for two-time FIFA® World Cup champion Argentina, led by three-time FIFA® Player of the Year and Ballon d’Or winner Lionel Messi, on Thursday, June 7 at Red Bull Arena in Harrison, NJ. The event will be part of Argentina’s week-long activities in New York as it prepares for its highly anticipated meeting with five-time FIFA® World Cup champion Brazil June 9 before a sold-out MetLife Stadium (3:00 p.m. ET / Gol TV). The international friendly, which sold out in just over three weeks, is the fastest-selling soccer friendly in U.S history. Tickets for the Argentina open practice will go on sale Friday, May 11 at 10:00 a.m. ET and can be purchased by calling Red Bull New York at 1-877-RBSOCCER. To purchase tickets online or for more information, visit https://tickets.newyorkredbulls.com. For each team, the hotly anticipated visit will serve as a return trip to the Big Apple. Both Brazil and Argentina played the U.S. National Team at MetLife Stadium, on August 10, 2010 and March 26, 2011, respectively. For Brazil, the visit is one of many international stops on the Gillette Brazil World Tour and the third of their 2012 U.S. visit. "We are thrilled to be hosting Argentina - widely known as one of the top teams in international soccer," said New York Red Bulls President, Business Operations Chris Heck. "At Red Bull Arena, we provide an one-of-a-kind atmosphere for our fans and supporters and we expect that this event will be a great opportunity for Red Bulls Season Ticket Holders, soccer lovers and sports enthusiasts across the New York area to see some of the best players in the world." Commonly known as the “Battle of the South Americans,” the Argentina-Brazil rivalry dates back to 1914 and spans 92 matches over 97 years. Heading into the June 9 match at MetLife Stadium — which marks the first time the two powers face off on U.S. Soil — the all-time record stands at 34 wins apiece and 24 draws. While La Albilceleste boasts Messi, A Seleção features one of the brightest young stars in the world’s game in Neymar. Argentina, home to one of the sport’s most iconic figures, Diego Maradona, is one of only five nations to hoist multiple World Cups and is a 14-time continental champion. Brazil is largely considered the most successful federation in international soccer, home to many of the sport’s icons, including Pele, Ronaldo, and current Real Madrid superstar Kaka. Brazil is the only nation to win five World Cups and is an eight-time continental champion. Founded by Henry Cardenas and representing Argentina, CMN Sports is a division of Cardenas Marketing Network, the nation’s leading multicultural event marketing agency. CMN Sports has produced brand-building campaigns for corporate giants such as Anheuser-Busch and Wm. Wrigley Jr. Company. Its partnership with the Argentinean Football Association (AFA) includes the exclusive U.S rights to manage two-time FIFA® World Cup Champion Argentina, featuring three-time FIFA® Player of the Year Lionel Messi, through June 2014. The first match as part of the partnership took place on March 26, 2011, as Argentina played to a 1-1 draw against the United States at MetLife Stadium before a capacity crowd of 79,000. Red Bull Arena is the benchmark in North American soccer landscape and sets the standard for other soccer venues across the continent. The 25,000-seat, state-of-the-art facility, located in Harrison, New Jersey, is the home of the New York Red Bulls of Major League Soccer (MLS). The arena is structured to create atmosphere as fans in the front row are just 21 feet from the touchlines. Its dynamic roof is a curving structure that wraps the entire arena in an elegant metal shell to create an architectural statement of power and elegance. The roof extends 120 feet from the last seat to just over the field's touchlines, with 60 feet of the roof being translucent, letting in natural light. 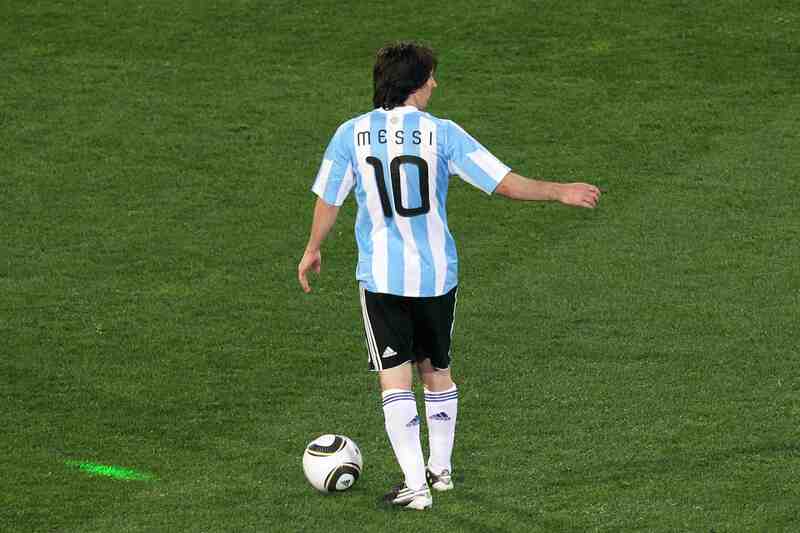 Lionel Messi will lead Argentina in an open practice June 7 at Red Bull Arena.